If you have not heard, myself and three Nations Network compatriots (Josh Weissbock, Moneypuck, and Rhys Jessop in alpha order) have been working on improving draft analytics. The project has been going on for well over a year now and is still in progress; however, we have started to release where we are at currently with Prospect Cohort Success (PCS). Weissbock released an introduction to PCS percentage and PCS points per game to the masses. Essentially it looks at the closest comparable players in age, height, and scoring for the same league and then calculates what percentage of those cohorts made the NHL for 200 or more games played, as well as the cohorts combined points per game. 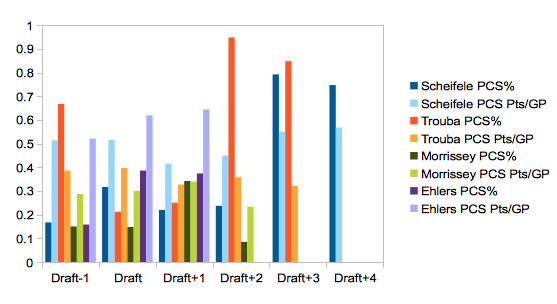 PCS can be used to look at potential draft selections, but also to look at player development. Let’s take a look at PCS for the Winnipeg Jets first round picks. 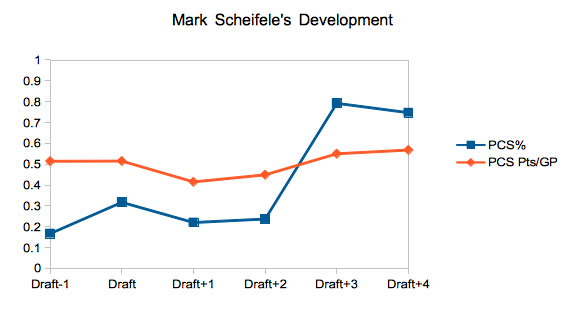 Mark Scheifele will always be a hot topic draft. It was the franchise’s first selection since rebranding itself as the Jets. The once highly regarded Sean Couturier had fallen, predominately due to concerns on offensive upside and effects of mononucleosis. Regardless, Scheifele has developed into a very nice player. His statistical cohorts have tended to sit around a point every two games over their combined NHL careers. It’s interesting to see how well PCS did in projecting Scheifele’s 0.538 NHL point per game production even when looking at Scheifele’s OJHL career and comparing him to other CJHL leagues. Jets next draft pick is Jacob Trouba. 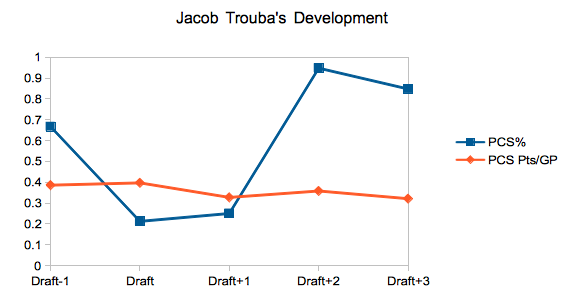 Prior to his collegiate performance, Trouba was always projected as more of a defensive defensemen… which was odd, as his scoring numbers were always relatively excellent. There is a noticeably large leap in PCS percentage in Trouba’s Draft+2 season and Scheifele’s Draft+3 season. These are their NHL rookie seasons. Graduating from one league to a higher level –especially a pro-men’s league– often leads to jump. It is meaningful that the coaches trust the players at such a young age, even if they do not score much. This is why we would see large PCS percentages for low scoring players in levels like the SHL. Just playing in the SHL is an accomplishment which impacts the model. In Trouba’s and Scheifele’s case, making the show at 19 and 20 is a huge deal, and all but guaranteed that they would make 200 games. 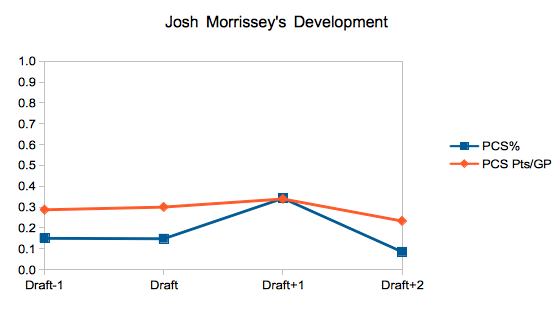 Josh Morrissey was called a reach by many. The Jets went high on upside when they went for the cerebral, young smooth skater. Morrissey has not posted numbers indicative of him being as high of a scorer as Jacob Trouba, but his cohorts have been players that have produced relatively well. Looking at Morrissey’s development, there are indications that a high shooting percentage year drove Morrissey’s jump in his Draft+1 scoring. The next year, Morrissey took a secondary role as the Kelowna Rockets split their two star defensemen. This loss in even strength and power play time likely impacted Morrissey’s projections as well. This raises two areas of weakness with PCS. Shooting percentage fluctuations can alter a player’s performance relative to their talent level. Although, over enough sample this should even out. Lack of ice time sensitivity also raises potential bias. For the most part this is not a problem as the best players tend to play the most; however, even in the NHL there is a trend for the second best blueliners to play the third most minutes. Nikolaj Ehlers has been one of the poster boys for the project. Long ago Jessop discussed why a team was better off drafting a player like Ehlers more often than not over a player like Jake Virtanen. 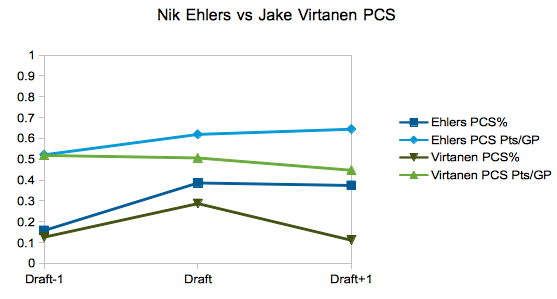 Ehler’s has been an elite performer despite being slightly “undersized” at 5’11, compared to the “significantly taller” 6’1 Virtanen (and don’t start on weight which seems to have no relationship with NHL success). 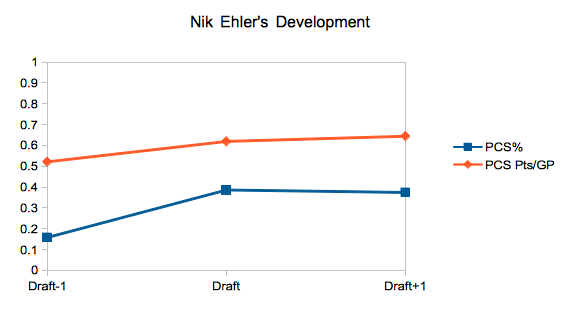 The Jets should be really excited for their future dynamic, young forward, Nikolaj Ehlers. It should be noted that Virtanen suffered a shoulder injury and also played on the second line for parts of the season, both of which could be impacting his Draft+1 results. PCS currently resides in its infancy. We have factors we want to look at: shooting percentage regression, quality of team and linemates, primary to secondary assist ratios, etc. Still, we are pretty excited with what we have and where we are going. Scouting is about retrieving as much information as possible on players in order to try and predict as accurately as possible how a player projects in the long run. How anyone could not want more information, like how similar players in the same league projected, is beyond me. No comments? How come no one has told you that you’re wrong yet, Garret? The average weight of hockey players in the NHL is over 200 lbs. I like Hintz because he has played well against the top Finns. He would be a good late 1st round pick. I’ll draft a team of heavy players and injure your team of Ehlers no contact league players in game 1 of any playoffs. The Danish B league is the one with the rigged game and the goalie who begged his backup to take a fall. I wouldn’t have picked Ehlers in the first round. For example, you could just sign Dadonov now and get a chance at getting the player Ehlers might be. Ehlers isn’t putting up numbers like Drouin. I’d like to see him traded to the WHL to size him up properly. That seems like a natural development progression, to be traded to the WHL in one’s last season. I’d take him around 25th. All I have is a 2009 yearbook. I looked at the 1st 10 team’s summer rosters. In the 08-09 year, those teams had only 5 players who were under 180 lbs and had at least 10 goals (Svatos, Pominville, P.Kane). And the greatest player was small. I’m really being constructive here. Yzerman tried getting lighter in the late 80s and got injured. That is how the 2010 Bruins got by the Sabres in the first round: they injured Connolly and Pominville and maybe D.Roy. I’ll leave it for this year. I’m confortable being judged on the prototypical player N.Ritchie, taken right after Ehlers. Lighter forwards are easier to roster move for. I’d’ve taken Ribiero and Semin as UFAs, so is mixed. I’d think by referencing the S.Gomez contract, smaller players shouldn’t be too irked…a lot of Gretzky’s goals were on the ice. It takes more strength to lift the puck now that Roy invented the butterfly. Treat for hockey fans: TB and Chi are the most offensive matchup since 2008-2010. The combination of Kane and Toews is maybe a lesson for the 2016 World Cup team. Seeing Ritchie’s playoff point total, I’d have him as the 5th overall best pick last year. Being smaller will be an issue for Morrisey. He won’t be able to put his shoulder into Perry’s head next playoffs. Is certainly an NHLer, but he reminds me of Chara without the size/shot. The Jets had a gem scouted in trying to get Domi. Whoever they like this year, I’d say go for the trade. Gotta shake things up. The Mrazek and Pavelec starts were mistakes. It looks like the Hawks played it right with the goalie platoon. That is something Price wouldn’t have allowed in 2014, but wishes he had a cup now. It is an issue of how much you want to injure the forward. As a third stringer in a late season game against a conference rival, I use a wooden stick and maybe am a German goalie to any forward that dive into me on a breakaway. Those forwards would angle wide subsequently. This blog could use a series win.